This restaurant is in a strip mall next to the Target in Tigard. It is a short walk from the Embassy Suites across the street. I went here with a colleague last week while on a business trip. When we walked around the corner and saw that the place was filled pretty well, we figured we had made a good choice. The conveyor belt is worth stopping in for on its own. An endless stream of sushi passes your seat at the bar. Plates are color-coded, with the simple pricing plan displayed on the wall. A server will bring your drink order. Be aware that there are no refills on the pop (yeah, I'm from Chicago--I know, you probably call it "soda"). My colleague was eating vegetarian that day, and he had several options to choose from, including a salad, edamame, cucumbers, and vegetable sushi rolls. He and I ate our fill, and we were quite surprised that entire bill for both of us came to only $18. Quite affordable. Although it wasn't the best sushi I have eaten, it was good, and it was certainly fun to grab it off the conveyor belt. Iv'e eaten at Hana sushi several times and it is very good .They charge by the plate and even do special orders.It's always crowded so thats a good sign, and the prices are reasonable.I can make my own sushi and sashimi but it is time consuming ,so we come here because they are very fast and you have lots of different choices. 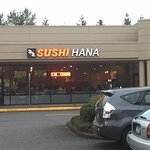 Been to Hana Sushi? Share your experiences!